Honestly, this is the best way to shuffle these tiny cards. Ah, the things that we find interesting in America. We’re fascinated by happenings that range from the invention of the doughnut to Janet Jackson’s Superbowl wardrobe malfunction. It’s this love of everything significant, poignant, or just plain weird that drives Timeline: Americana. This game promises a fun, quick romp through America’s pop culture and history. Does it deliver, or should you just stick with your subscription to People magazine for your random fact fix? 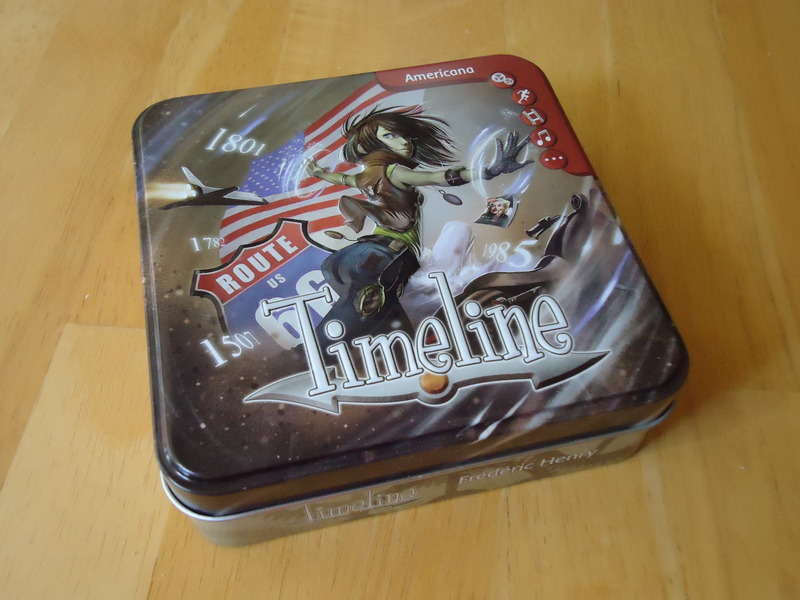 Timeline: Americana is another entry in the now-extensive series of games under the Timeline banner. It is a simple game of placing cards in the correct order on the ever expanding timeline. At the beginning of the game each player is dealt four cards, event side up, and these are placed in front of the players. (Do not cheat and look at the reverse side which shows the date of the event!) The remaining cards are placed in a draw pile at the edge of the table (date side down) and the top card is placed in the center of the table, date side up. This is your starting date on the timeline. The first player then plays any one of his cards onto the timeline. It can be played either before or after the starting event. After you place it, turn it over to reveal the date. If you placed your card correctly, you have successfully eliminated a card from your play area and play moves to the next person. If you made a mistake, the card you played is placed back in the box and you must draw another card from the draw pile to take its place. The next player will have more options for where to place their card. Now the card can be placed at the beginning or end of the timeline, or between the two events. Again, if you get it right, you’ve gotten rid of a card. Get it wrong and you have to take another card. 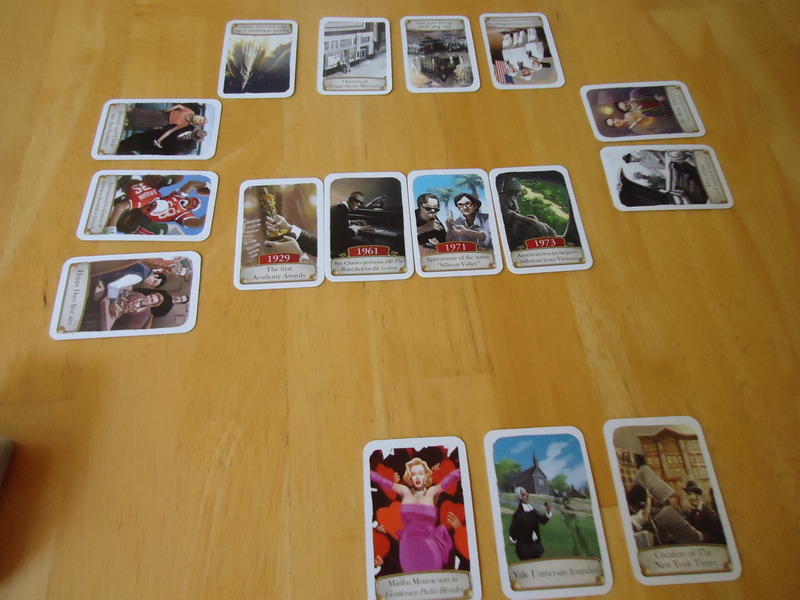 Play proceeds like this with each player adding to the timeline until everyone has had a turn. After each player has had a turn, the round is over. If one player got rid of their last card during the round, they are the winner. If more than one player got rid of their last card, the game continues. All other players are eliminated and the players who eliminated their last card each take one card from the draw pile. They continue playing until there is only one person in a round who plays their last card correctly. This game is like catnip for pop culture junkies, history buffs, and people who like to show off their knowledge of random stuff. It’s fun to play with and it can turn you into a Timeline junkie. The games go so fast and are so much lighthearted fun that you may feel a little euphoric and find yourself yelling, “Again!” after the game is over. This’ll last for awhile until you find yourself wearing down, whereupon you’ll crash from factoid overload until the urge to play hits you again, likely the next night. Okay, that might be overstating things a tiny bit. You won’t be rolling on the floor like a cat high on catnip, after all. (At least I hope not.) However, Timeline will give you a decent amount of fun if you play it in the proper mindset. This is not a high stress, competitive game with lots of strategy and deep thinking involved. This is, as I stated in the opening, a fun romp through American pop culture, with a little significant history thrown in. It’s designed to be played quickly and in a lighthearted spirit. (And no sneaky looking up dates on your smartphone under the table. That would be cheating.) If you or your kids get a little education out of it, then that’s a bonus. The references in Timeline: Americana are more tightly clustered than in preceding Timeline games. 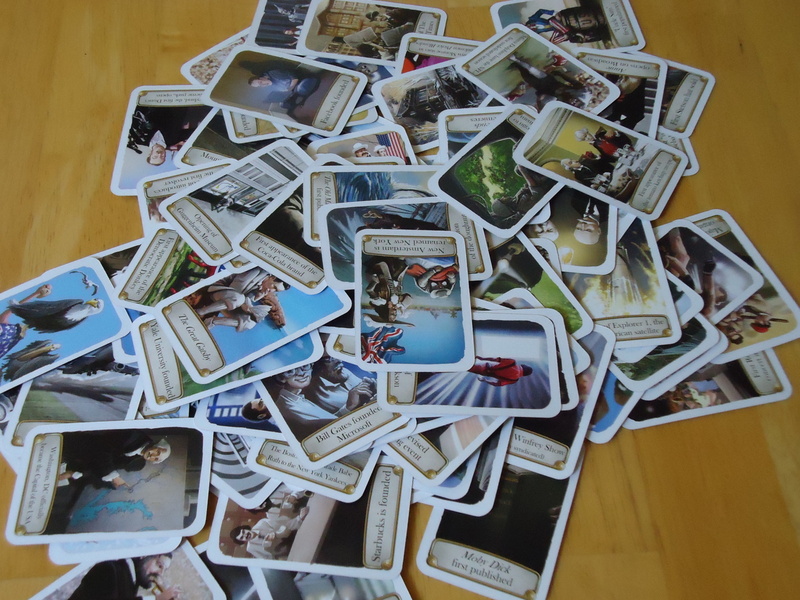 Whereas a game like “Timeline: Historical Events” covers centuries of history, this one has only a few cards that go as far back as the 1500’s. Almost all of the references are from 1900 to the present. This isn’t a bad thing, though. I think it makes Americana more challenging than some of its predecessors. Which is harder? Knowing that the invention of fire came before the printing press, or knowing that The Jazz Singer came before the creation of Mickey Mouse? (Hint: They’re only a year apart.) Americana is a bit harder because you have less margin for error and less “signpost” cards giving you broad hints about where to go. Kids and those not from America will likely be at a slight disadvantage in this one. While some of the references in the game are historic, many are pop-culture related. All are American-related and less global in nature than previous sets. This means that unless it’s something covered in school or that they’ve just happened across, it will be harder for kids and those less familiar with American culture to place the references. Do kids know when M*A*S*H premiered, or when NASCAR was founded, for example? Regardless, the game still offers some fun teachable moments and light education. Otherwise, this one makes an excellent game for a group of adults. Most adults are likely to have had some exposure to many of these references and will likely enjoy the trip down memory lane. We played it with my parents and had a great time. They knew a lot of the references from the 20’s to 60’s, while we were better at the more recent stuff. We ended up pretty much splitting anything earlier than the 1910’s, mostly due to some lucky guessing. My parents were surprised at how much they could remember. It was a case of, “I forgot I knew that!” which brought on a pleasant smile when they did, in fact, remember something. We also got a lot of great stories out of them as they elaborated on the events beyond just the dates. And we got to teach them a few things, too. This game scales well from 2-8. With more players the timeline gets more complicated more quickly, but that just adds to the challenge. In a two player game, you have a few turns before the choices get really hard. But with more players, the line is growing so quickly that by the time your next turn comes around, you may have a lot of potential placements to consider. With eight, you’d better know your stuff, or be playing with people who know nothing! It’s also a fun solo activity. You can just deal out cards and try to construct your own timeline. Good for passing the time, testing your general knowledge, or learning a few light facts. It’s worth noting that while this is a standalone game, it can also be combined with any of the other Timeline games in the series. More cards equal a more epic, difficult game. Having multiple decks also makes it harder to memorize the cards. After multiple plays (especially if you play a lot of games within a small window of time), it’s possible that you will start remembering more and more dates. (Hey, you learned something!) But this can diminish some of the fun, particularly if an experienced player brings the game out with a new player. Having more cards reduces this possibility. Just know that once you start mixing decks, it’s almost impossible to separate them again because there is nothing on the cards that differentiates them from set to set. You can also adjust the difficulty/length of the game by dealing each player a larger number of cards at the beginning. It’s harder to get rid of six cards than four, for example. This rule applies whether you’re playing with just this set, or multiples. It’s a nice way to increase the challenge once you’ve got a few plays under your belt. As far as the components go, they are well done. 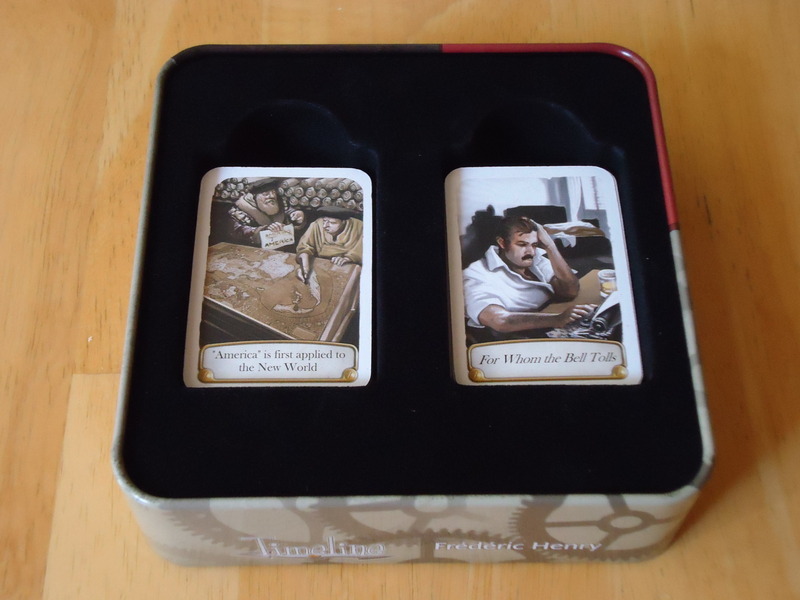 The cards are sturdy and the box is an attractive tin with a fuzzy liner that helps keep the cards in place. My only gripe is the tiny size of the cards. Shuffling is nearly impossible unless you just take the, “Dump the cards on the table and mix with your hands” approach to shuffling. And the more sets you have, the more this becomes the only viable way to mix them all. I can live with it, though, in exchange for a game that is small enough to tuck in my purse for quick games on the road. All in all, this game was much more fun than I expected it to be. It’s not going to fry your brain, give you tons of strategic choices, or take up your whole game night, but it is a great game for family gatherings, parties, or for something to play when you’re out and about. And, being a fact junkie, I thoroughly enjoyed learning a few new things that I didn’t already know. Small and portable, can be played almost anywhere. Simple rules make it accessible for most ages and groups. Lucky guessing or getting cards that you already know can lead to 'lucky' wins. May be a bit harder for kids and those not familiar with American pop culture than some of the other Timeline games.